After months of tinkering with an XEGS that only started to a black screen I've finally managed to get it to work! I've replaced all the capacitors, transistors, both RAM chips, and the OS ROM and also desoldered all major chips in order to test them in other computers. 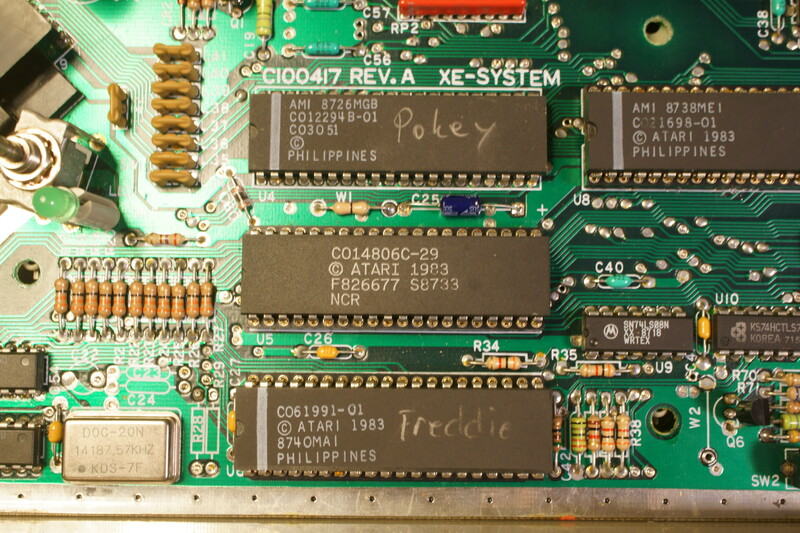 In the end it turned out that the Freddie chip was the real culprit (last chip to be tested, obviously), though I'm fairly certain the RAM chips were faulty as well. There is one niggle left however that I hope someone can help me with. Despite the XEGS now starting and running properly, it does not display any colour and I've tried both RF and composite. Any idea on what might be causing this? have you checked the associated components between GTIA pin 21 and the composite out? Have you tried adjusting the color pot? You didn't mention anything about that in your post. Edited by Paul Westphal, Thu Mar 7, 2019 3:30 PM. No I have not checked all the components, but with the the picture you've attached it will be much easier. Thanks! I've tried it but it do not seem to do anything. here is the rest of the set - i assumed you already had it but well done for getting it going without it! I'm pretty crap at reading diagrams but I am slowly getting better. So I've checked pretty much every component that is between video out (both RF and composite) and the GTIA. I found one resistor (R80) that measures 1k Ohm instead of the described 2k and one diode (CR4) that might be faulty. I haven't been able to test the L5 coil. Just to be sure, I desoldered the 4050 chip and tested it in a 130XE and could conclude that it's not the source of the problem. 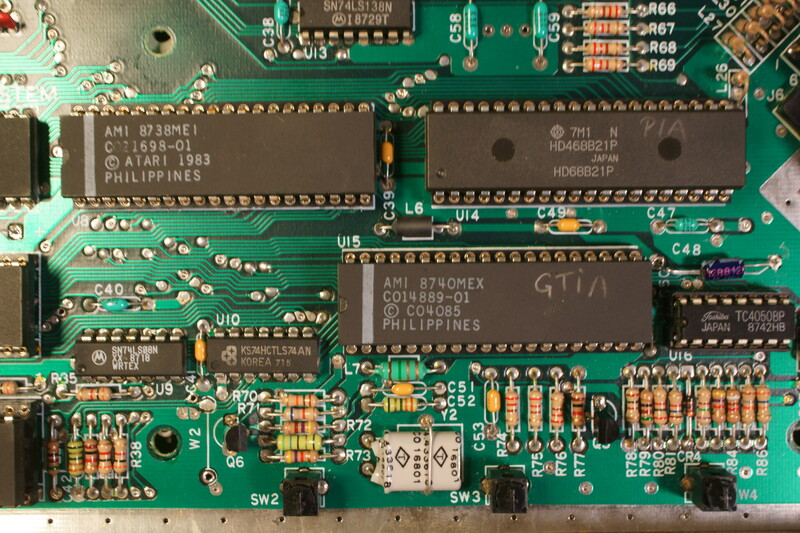 I'd check everything around GTIA ANTIC, the crystal and transistor section of the board for bridges, breaks, and cold joints, make sure all pins are in their holes and you didn't damage any pads or traces..
Is the machine PAL or NTSC? It's supposed to be a PAL console but this problem does seem like it could be an NTSC issue. Now since I have concluded that the XEGS Freddie is dead, I had to borrow one from the 130XE I own, and that's what the last picture is of. So they're both PAL, not mismatched PAL/NTSC. Nice work replacing all the sockets, but in the process of replacing them a trace or through hole might have been damaged... Back to checking other things as posted previously. Have these two chips tested good in another system? That might be the most telling symptom ever. more and then see if it does something now. One at a time they have but just to be sure I swapped both with the chips from a 600XL. In the 600 the chips works great, while the 600 chips in the XEGS show the same problem, ie no colour. So it has to be something other than the chips. Did just as you suggested and no difference. Nothing happens when I turn the dial, neither on RF nor composite. I've measured the pot and it gives the proper resistance and it is connected to the proper components so no broken traces. That said, there might be something connected to it that doesn't work as intended. Might be worth replacing Q5? Edited by 1050, Sun Mar 10, 2019 6:25 AM. At first I was ready to dismiss this advice as I had already replaced Q5. Then I started looking closer and discovered that there are TWO Q5 on the diagram. 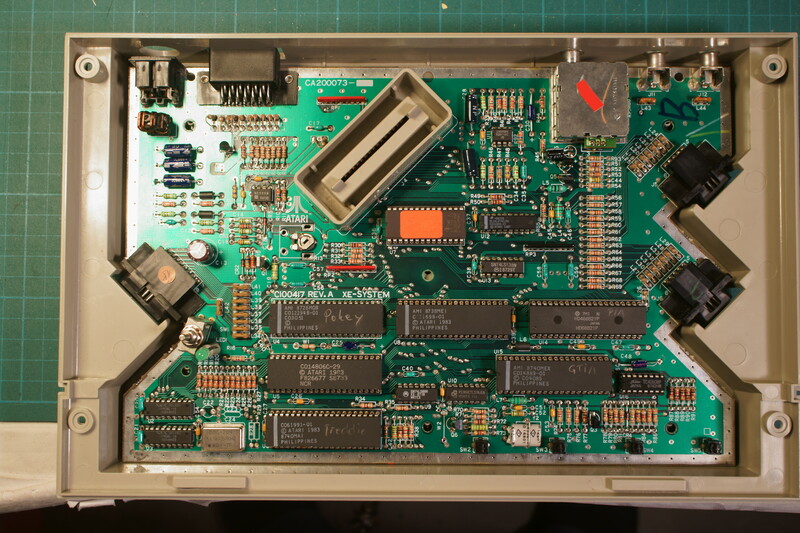 In fact when I take a deeper dive in the XEGS diagrams I was linked to earlier, I can see that there are several missing components compared to my machine. Could it be that my revision is different? It's a Rev A by the way. Could you supply me with a Rev A set of diagrams? Edited by Macross_VF1, Sun Mar 10, 2019 7:12 AM. I don't like the soldering on the left leg of C48, and I see it is a non-standard part. Might we have an issue there? you called it... looks nigh on empty and look at the trace leading to it.... that's something terrible... needs tlc for sure. Unsure. It's just a cap to GND, but it has the potential to kill a signal if shorted, wrong value, etc. We'll see, hopefully. You're like me in that respect, if it's dodgy, fix it up and/or replace it. easy to do and one less thing to worry about. the color pot r13 is turned all the way down/ off in the photo... adjust to just shy of half way while it is on.. see if color comes and goes..
Edited by _The Doctor__, Sun Mar 10, 2019 10:18 AM. Could it be that my revision is different? valid, this creature however is another bag of worms entirely. eyes and verify, verify, verify. I'm stunned it even runs with that many components missing..
Best of luck retracing the missing stuff and replacing it all, hope its a winner after all that! didn't fill out when it wasn't necessary. and see nothing too horribly wrong that's obvious. it is instead green brown black resistor - 51 ohms. all we can do anyway. 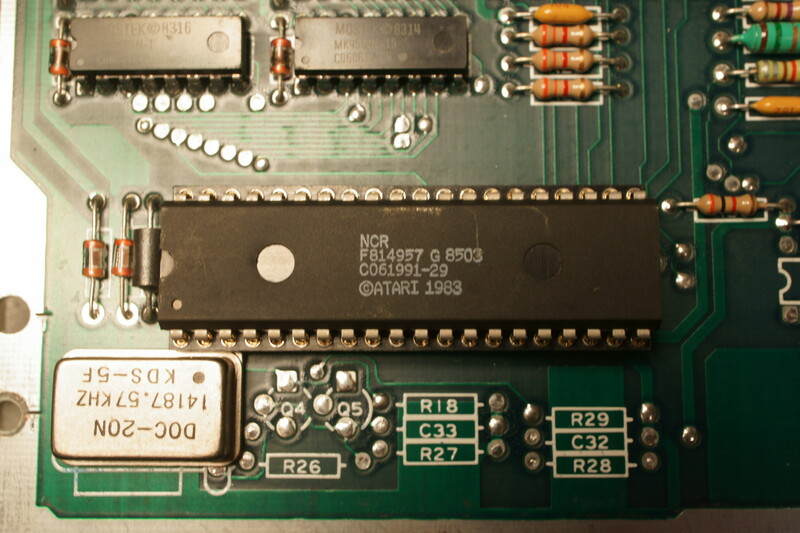 I eventually gave up looking for R70 (which has a strange solder blob under it in the photos) on Sobola's schematic when I noticed duplicates of Q5 and a number of resistors. Time for a report. The sockets I've installed have been verified to be connected to the correct points. I've even tested that the chips make good connection with the sockets themselves. I have also spent some time looking over the entire bad for potentially bad solder joints and I did find a lot that I had to touch up. You don't have to worry about the caps however, they were some of the first parts to be replaced and I quadruple checked the type, voltage, capacitance and polarity when I installed them. There are still two Non Polar ones I haven't replaced however since the replacements turned out to be about four times as large as the original ones. Since we have concluded that the XEGS schematics are mostly incorrect, I've instead tried to manually follow the paths to and from the trimpot. So far I've identified that it connects directly to pin 17 on GTIA and through a few components to pin 3 on Sally. I don't know if that's useful information however. Should I perhaps try to replace it just to be sure it's not bad? Here my normally excellent English knowledge fails me. I can't for the life of me understand what silkscreened mean in this instance. Anyway I've replaced Q1 and no improvement.